I just got home from the post office not long ago. I carried a very special package - a small brown envelope, actually - to the counter and shipped it off to Christi Belcourt in Ontario. Christi is not only an extraordinary Metis artist, but she is also an extraordinary person with visionary ideas. 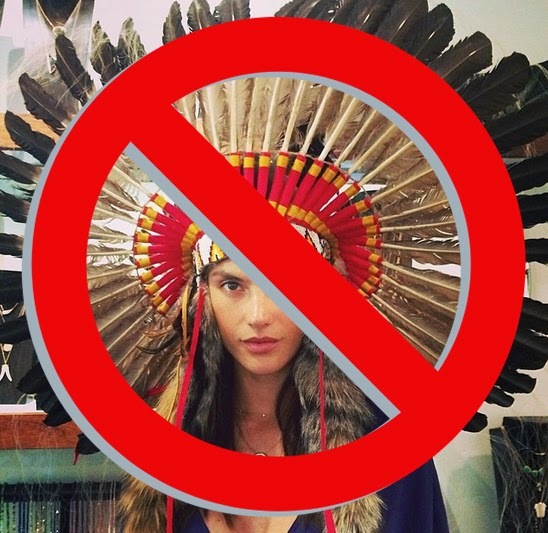 One of her latest endeavors has hundreds of people willingly participating in a very important and powerful project. That project is called Walking With Our Sisters. A year ago, Christi sent me a message detailing the basic concept - she wanted to create an art installation to honor and raise awareness for the 600+ missing and murdered Indigenous women of Canada and the US. 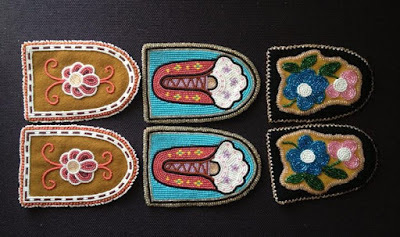 She was asking everyone she knew if they would be willing to bead a pair of moccasin tops for the installation. Her goal was to have 600 pairs. She explained, "I'm picturing a winding path of beaded vamps on cloth over a gallery floor. Viewers would need to remove their shoes to walk over the cloth and walk along the path.... This idea only just came to me on the weekend as I was driving to Ottawa. So right now I'm writing to see if there is interest in participating in this project." This small idea grew and grew. Christi launched a Facebook page where participants and other interested people could find more information about this project, and the page now boasts over 7,800 members. 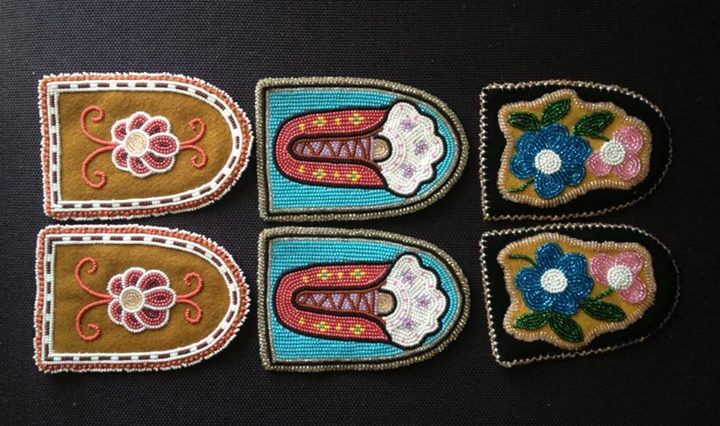 Of these members, hundreds have created and contributed moccasin tops to this project. [2015 Update: They received over 1,700 pairs coming from over 1,300 contributors.] I am one of the contributors. The deadline for the project, July 15, crept upon me quickly. 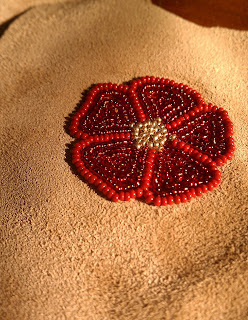 I hadn't thought about what I was going to create for it, but when I sat down to do it I immediately knew that I wanted to bead a pair of wild prairie roses on tan leather. They are common here, and just the other week I was outside with my sisters and we saw them and remarked at their beauty. The ones we saw were white, delicate yet persistent. They can also be pink, or pink with a purple hue. 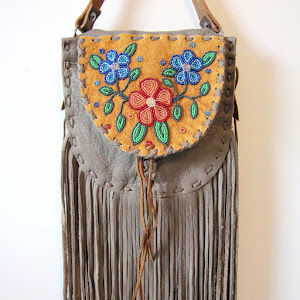 In Anishinaabemowin, they are known as Bizhikiwiginiig, or 'buffalo rose flower' - named because they flourish among and because of the buffalo. For me, the power of these varying factors hit me quickly and assuredly, and as soon as I wrote down Bizhikiwiginiig, the phrase "She Grows As Wild Roses" came through my pen and onto the paper. The phrase takes on numerous important meanings for me. I envisioned her red, as red is a color of ceremony and power, and I beaded the Bizhikiwiginiig with red petals and glistening gold cores. Since I do not bead often, I always forget how much time it takes to bead, how much patience, attention, and good thought is needed to create the patterns, but I had the beautiful and bright morning light to guide me. So many individuals have submitted extraordinary miniature pieces of art, too many to show, so instead I merely pulled the latest pictures from the Walking With Our Sisters page. 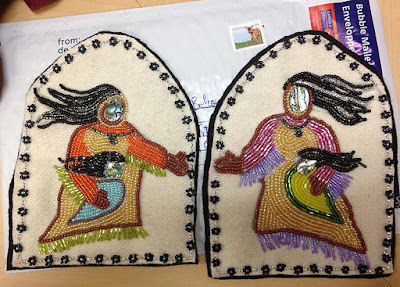 The first comes from Tee Shawnee, who says, "Circa Oklahoma: Being a bead work artist and multimedia artist my heart is upset that I did not get to fully bead these as I intended, but my heart is deeply connected to the awareness and cause of this issue. So instead I've included these as multimedia pieces that show the beauty and strength our women have always carried even if it was attempted to be stifled, unseen, or over shadowed. Our women are beautiful and strong, let's continually remind each other of that"
The second comes from Tracy Lee Bear, who said, "My sister Debra came down from the Yukon to Edmonton to help with our mom. When I talked about the project, she wanted to bead some vamps too. She only had three days in Edmonton, so we started right away. Her design idea was to have a mother and grandmother each holding a grandchild, symbolizing reaching out through generations. She had to go before they were done, so I beaded like crazy to meet the deadline today. It was so nice to 'walk with my sister' in this way. I feel so grateful for my sisters and a deep sorrow for the sisters lost." The next artist, Sharon Angeconeb, said, "thinking of the women who left babies behind or never had the chance to have one. Thanks for allowing us to participate!" 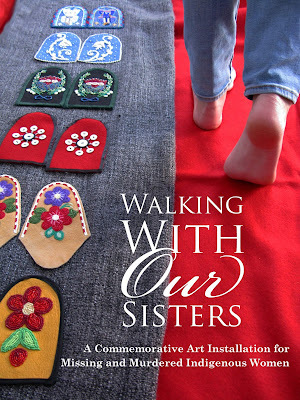 Indeed, being part of this project was an indescribable cathartic experience - to think deeply of our missing sisters, to channel them, to produce something with mind and hands, and to honor them, was an important process for me. 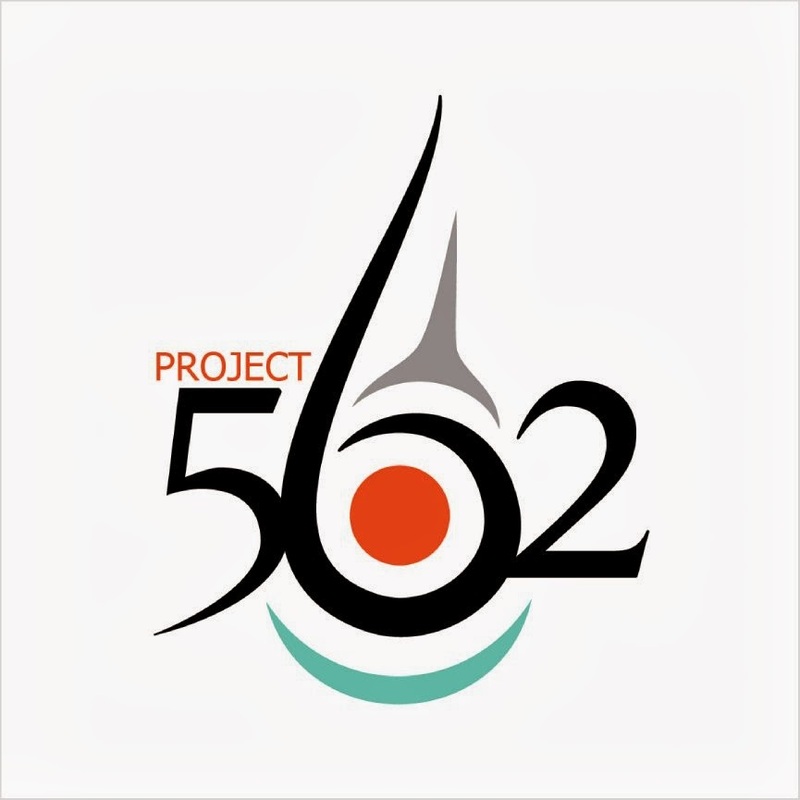 I don't think I can adequately express how significant this project is to me, and how important it is to fight for justice for those who have passed on before their time, and to defend and protect our sisters now and into the future. Christi explains, "Although statistics in the U.S. are not available at present, in Canada, it is estimated that 600+ native women have gone missing or have been murdered in the last 20 years. Many have vanished without a trace with little to no concern paid by the media, the general public or politicians. This is a travesty of justice. 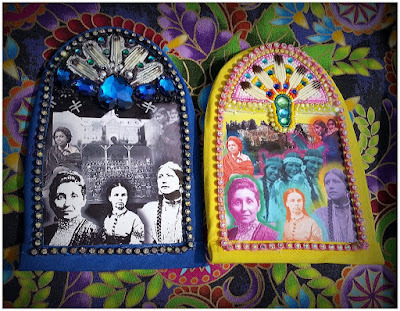 This project is about these women, paying respect to their lives and existence on this earth. They are not forgotten. They are sisters, mothers, daughters, cousins, grandmothers. They have been cared for, they have been loved, and they are missing." Click here to learn more about the project. Click here to view some of the contributed vamps. I too sent in a pair. Many with such beautiful vamps and experiences and stories brings tears to me eyes. I also sent in vamps, I think it's a wonderful project and it is raising awareness, and it is working! So many women have stories to tell, having either experienced some abuse themselves or have lost sisters, mothers, aunts, children or friends. It's been an amazing experience ,just seeing what each person has created,some worked alone, some in groups, some with families.It's been an honor to share these things with so many amazing women, girls , and even kids! One grandmother said her 3 yr old grandson was even helping to count the beads!! Beautifully said! I sent 2 sets. Then learned of a young girl in White Earth who was crowned 2012 princess, raped, and took her own life over it. I was so heartbroken I had to make a third set for Biidabin. This has driven my thoughts since joining the project and making such wonderful friends because of it. So worthy! Pinigigi (Winnebago Thank you) for sharing and explaining this so very well.